Pocket watches are the best things, which symbolize for the classical beauty. With the regardless of many smart watches on the market, pocket watches are still attractive. Pocket watches are simple accessories, but powerful. 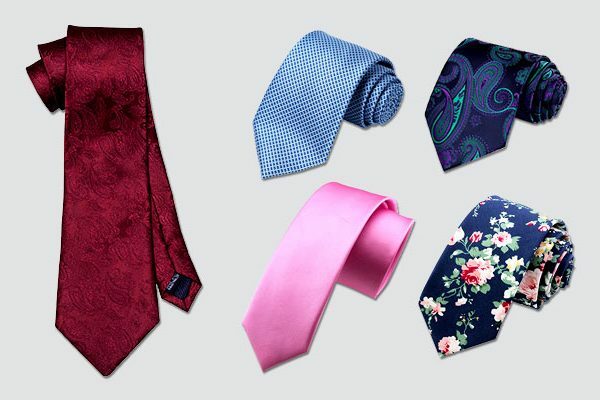 In order to add a flair look, these accessories are remained with different designs. In this day and time, it is quite difficult to find out a good pocket watch because it is almost replaced by modern watches. If you want to own a unique pocket watch, you can take a look at this list of men’s pocket watches below. This Gotham watch is the first one that I want to recommend to you, which always bring us a very classic look. From outside, this watch looks like a small mirror rather than a watch. But, when you open it, you will be surprised. The Gotham watch came with a chain for storage easily. You can attach it anywhere you want. The unique men’s pocket watches are quite useful for men because they can take the advantage of them as watches to see the time and date or they can attach them as an accessory to create their own styles. The Gotham watch is available with the presidential American eagle design. Its patterns and colors are classic. Furthermore, it has a bright white enamel dial mixed with the Arabic numbers, which are black color to make it more outstanding, compared to others. The shape of this watch is round and its thickness is about 15, so you may find easy to carry it to everywhere. This watch can be used for a very long time because of the metal material. In addition, with the mineral crystal, this pocket watch is scratch resistant to help you feel free to use at any time. Generally speaking, this watch is not a fashionable watch, but it is extremely attractive that made me glued my eyes into it. If you are looking for a gift for your husband or boyfriend, you should not ignore this pocket watch. 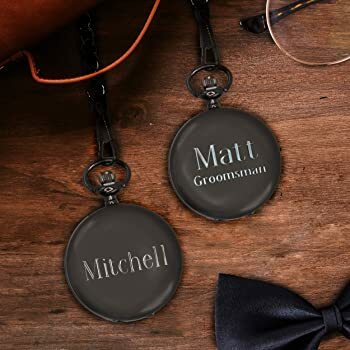 The Engraved “To my husband” pocket watch is an ideal choice for all men. With a unique and romantic look, I totally believe that your husband will be very satisfied. This accessory is highlighted with the sentences “To my husband, I loved you THEN I love you STILL, always have, always will”. By this way, your watch can be a tool to express your love towards your husband or boyfriend. This watch is made from zinc alloy, which has a high quality to make this watch always black and shiny. In addition, this material can make a great contribution to keep the engraving stand out as it is after buying. 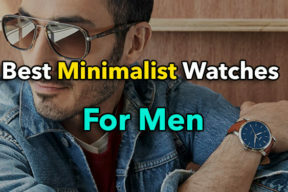 Besides, it is a very practical gift for men because they can use it as a normal watch to replace for their wrist watch. Furthermore, coming with a chain attached, this antique men’s pocket watch is more multifunctional. Your men will have a useful and fashionable watch at the same time. Its size is perfect to put into any pockets with the dimensions of 4.5 centimeters for diameter and 40 centimeters for the length of the chain. 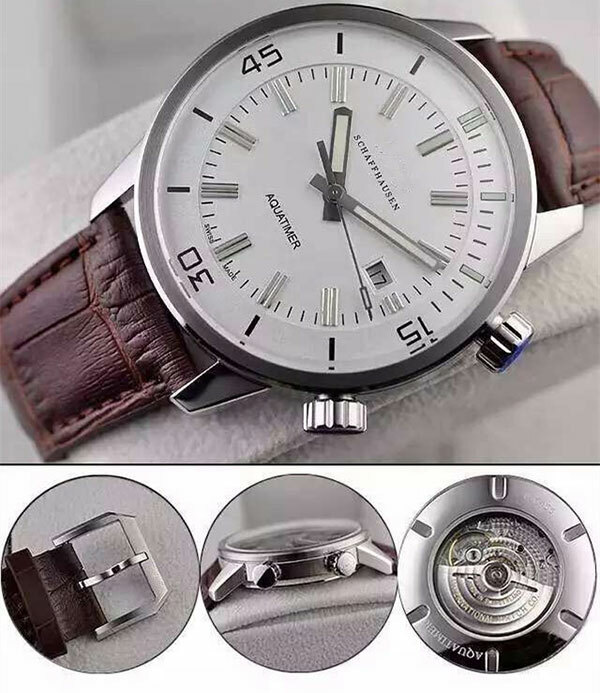 The next one comes from ManchDa brand, which is considered as one of the most reputable brands in the world and famous for many high-quality products, this watch is no exception. The ManchDa watch has four different colors, including: black, blue, white dial, golden dial and pink gold. Especially, this watch can fit both men and women, based on the color you choose. The ManchDa always bring us the most elegant design to meet the requirements of their customers. This watch also has a special design with a double cover, so you can let it stand on your table. This watch has roman numbers to make it look smart, fashionable, elegant and vintage. 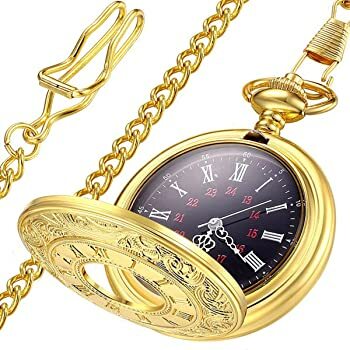 This box men’s pocket watch is obviously excellent with a long chain, which brings you a good feeling when you touch it. The front face of this watch is made from acrylic to resist the scratches. It is undeniable that this watch is attractive with the vintage design to fit with daily life and business occasions. You will look more masculine with this watch. Many people prefer it because this watch does not need batteries for movement. All what you have to do is to twist the top button, and wind it up before using. But you need to know that if you do not want your watch to stop working, it is a good idea to keep it away from the magnet. If you love vintage style, this watch is a perfect choice for you. I found this watch in an old shop and I fell in love with it at the first sight. This vintage watch has a very unique design. It is printed a sentence like a short letter with special patterns. This is a wonderful gift to give friends, relatives or teachers. Its functions are the same as any watches on the market. However, the difference is from the design. Although its design is quite simple, you may need to take some steps to open it. There is a crown, which is put at its top. If you want to open, you have to press this crown to open the front plate. Besides, the dimensions of this men’s pocket watch with date is perfect for carrying in your pockets. Its diameter is about 4.6 centimeters, while its chain is about 37 centimeters. With these measurements, we can carry it more easily. Furthermore, there is a necklace chain with the length of 31 inches. If you want to change your style, you can wear it as your necklace. Similar to the above watches, you had better put it away from the magnet to make sure that your watch will not stop moving. 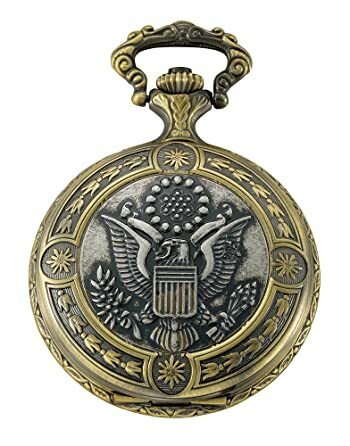 In comparison with both cell phone and wrist watch, the pocket watches are a kind of personal timepiece. To show off the personality, the Gunmetal Quartz pocket watch is the best item, which can be engraved whatever you want. The dimensions of this watch are quite small to put in your pocket or wear as a necklace. Therefore, if you want to show that you are a couple, you should purchase it. When buying this watch, you will have chances to engrave free without any extra cost. This is a kind of Japan quartz movement. Both its band and dial are black, so it will be never out of date. In addition, the face of this watch is about 1.5 inches in diameter, while its chain is 14 inches. If you pay for this pocket watch, you will never feel disappointed. This pocket watch has a classic look, but fashionable style. It can bring you back to the old time to discover the ancient values. Besides, you can take the advantage of this watch to create your vintage style. The personalized gunmetal pocket watch can be used as a normal watch to see the time and date. 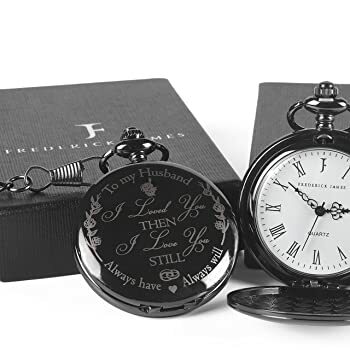 Apart from this engraved men’s pocket watch, it is a stylish accessory for both men and women. Another version of a pocket watch is the ManchDa roman copper wooden Steampunk mechanical skeleton pocket watch with chain. This version has more choices for customers with round and square shapes. Besides, it also consists of several different colors, such as brown, black wooden, red wooden and black. These colors are vivid and trendy. ManchDa roman has been always one of the most favorite watch brands. But, here, I want to recommend you the square shape roman copper with black wooden color. This watch features smart, elegant, fashionable and vintage. 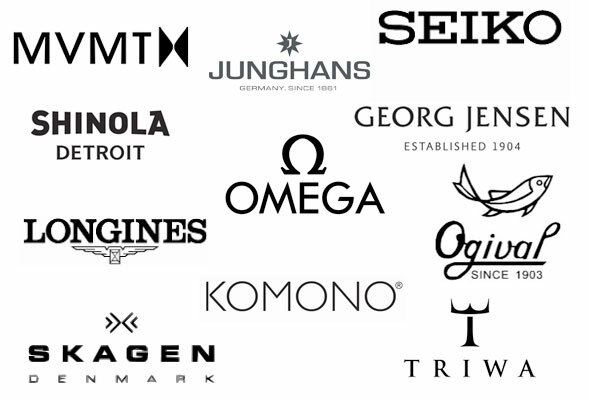 These features appear in any watches of ManchDa brand. The ManchDa watch contains roman numerals, and special skeleton dial included golden movement. I highly appreciate the quality of this watch, which can be used for a very long time without any scratches. Besides, this perfect choice can make your day with attractive design. You will change your thought about a watch. 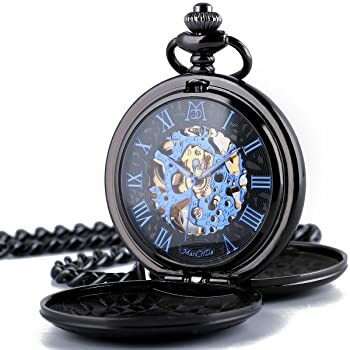 Normally, we just think that a watch is a fashion item, but more than that this pocket watch is an eye catcher to add class and style to your fashion and life. It is suitable for all kinds of outfit as vest, pants, or dress for ladies. 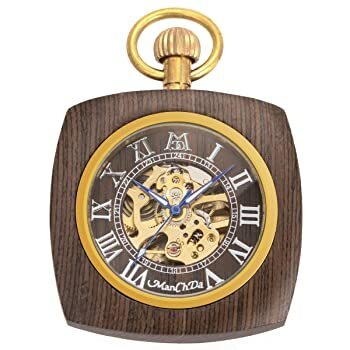 Using this black men’s pocket watch will make men look more elegant and masculine. 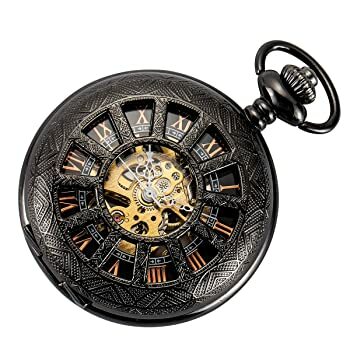 Although at the first sight, this watch does not have any special feature to attract you because it just looks like a normal pocket watch, when touching it, you will change your idea. This is another version of pocket watch from the Gotham brand that I mentioned above. This Gotham watch comes with a convenient design with a round shape to fit all pockets. It has a classic open face, which is called as a silver – tone pocket watch. This item has a thin polished brass case for engraving. There are two styles of railroad, including 12 in black color and 24 in red color of hour makers. The movement of this watch will be always correct with the Japanese analog quartz. 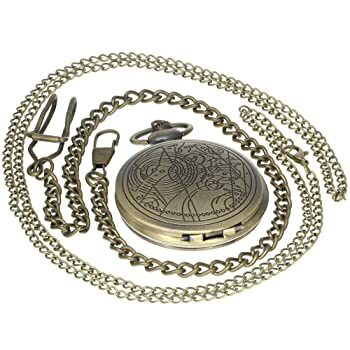 When buying this silver men’s pocket watch, you will get a deluxe draw string pouch for keeping it. Overall, this Gotham watch is well made, accurate and solid. 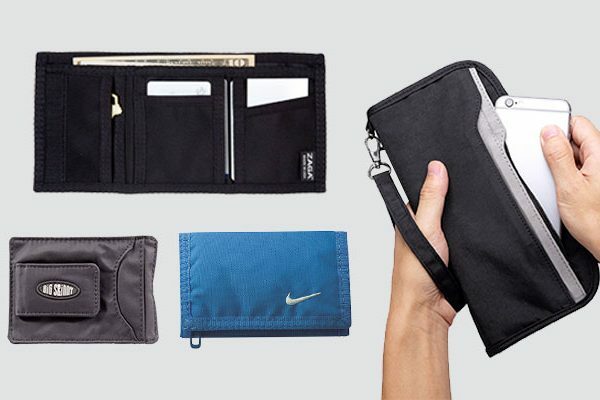 Besides, it moves quietly and has a traditional size to keep in your pocket easily. 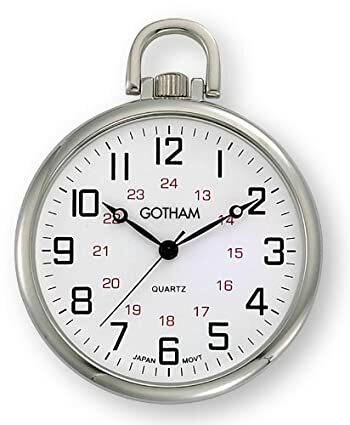 The Gotham pocket watch is trendy, so you do not need to worry about being out of date when using it. 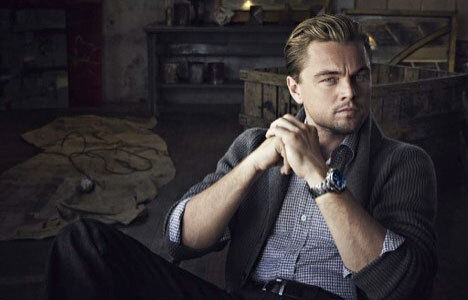 Furthermore, the Gotham watch is always one of the best choices for your men and a good idea for a meaningful gift. When talking about the pocket watches, it is necessary to take a look at LYMFHCH. The watch from this brand is high quality, durable, and fashionable. 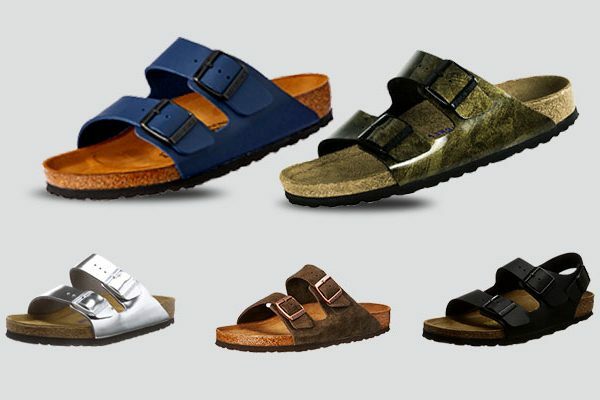 Apart from the gold color that I intend to introduce to you below, you can refer to some other color choices, such as black, white, gray, or brown. In terms of the size, this pocket watch has a reasonable size to keep in both front and back pockets. Its diameter is about 1.8 inches and the length of the chain is about 14.57 inches. Besides, if you like, you can wear it as a necklace with the detachable chain. The chain is long enough to secure it easily. With the roman numeral watch, this fashionable item has become a delicate gift for everyone. Although this watch has a very simple design, when opening it, there are a few things you need to know. You just need to press the top crown to open the front plate. In case, you want to adjust the time, there is a crown to pull away from the base of the watch and turn the clockwise to reach the exact time. 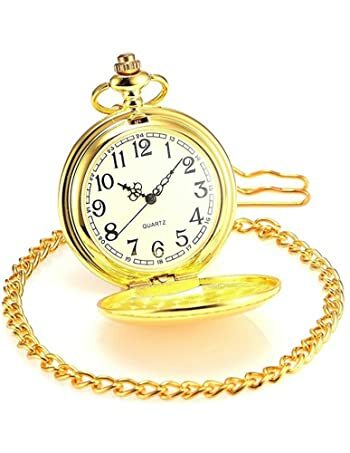 When purchasing this watch, you will get a package, including a removable chain, a gold necklace and a pocket watch. I always feel excited about the Jechin classic watch. This watch is innovated to bring the best consistency of the quality as well as the personality of the brand. This pocket watch is made from a perfect combination between the traditional style and inspired creations to create a fashion design. 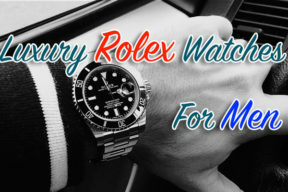 Furthermore, this brand is trustworthy to bring people who own this watch the quality, care and value. You will never feel disappointed, if you make a choice of the Jechin classic watch. It is a kind of high-end case with the quartz movement. In addition to this, this item consists of a retro royal crown. With the regardless of classic design, the Jechin watch is suitable for all kinds of fashion styles with the leading-edge fashion. It includes a removable chain with a hook to help you mix it more easily. This is a polishing smooth series pocket watch. The Jechin pocket watch is made from copper, so you do not need to worry about scratches. moreover, its chain is made of the stainless steel to ensure the durability. Aside with the high quality, its specification is also reasonable. The case diameter is approximately 1.8 inches, while its thickness is about 0.6 inches. The chain length is about 37.5 centimeters and a hook included. Another brand, you can refer is the Wenshida. This brand is famous for high quality products and this pocket watch is a great example. The Wenshida pocket watch has an eye-catching design with a huge number of wonderful features. It is considered as the best gift for yourself, your love and seniority. This pocket watch comes with an excellent workmanship to give us the awesome experiences. 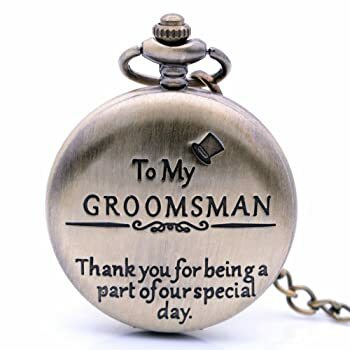 The design of this wedding men’s pocket watch is very elegant with a precise mechanical movement. Furthermore, within the watch, both blue and skeleton dial provides the exquisite structure and movement. Besides, it has an antique shape with the roman number and special blue dial. There is an additional removable key chain, which comes with a clip for easy carrying. This pocket watch is a great selection for both casual and formal dressing. The Wenshida watch is made from alloy, which is known as the most durable material and anti – scratches. The specification of this watch is 48 millimeters for the case diameter, 14.5 millimeters for the case thickness, and 370 millimeters. To set the time of this watch, you do the same as others. To charge the power, you just need to rotate it from 10 to 15 turns. You have to do it every day, unless it will not work. If you are looking for a gift to give your dad, you can take this watch into the account. This is a product of a reputable brand, named Levonta. This watch impressed buyers with its unique look. Besides, you can write what you want into it to show your love and promises. This watch belongs to the antique type with a shiny black color. Both the chain and case are made from alloy. 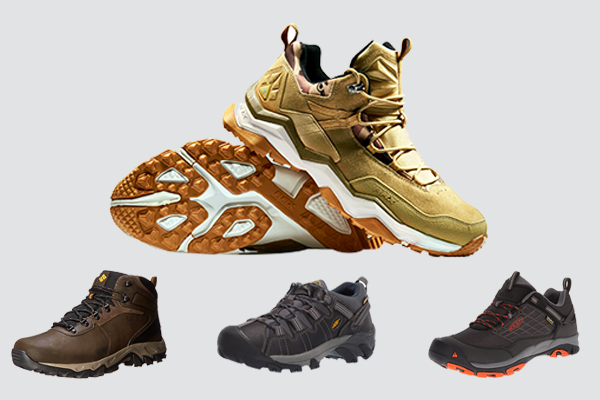 Due to the good quality material, it is solid, shiny, durable, lightweight and trendy. 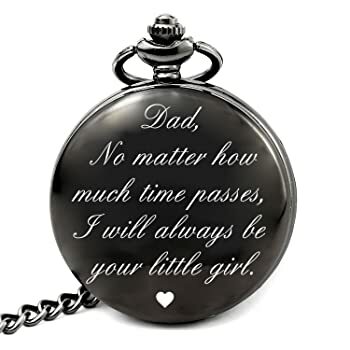 This dad pocket watches for men can be suitable for all genders. Additionally, it comes with reasonable dimensions; therefore, sometimes, you will feel like you don’t carry any watch in your pocket. Its diameter is about 1.8 inches, and the chain is 15.7 inches in length. If you buy this package, you will get a pocket watch, a chain, a waist chain, an instruction card and a gift box. I really like the waist chain and I often wear it all day long. I take the best use of this watch as my fashion item to create my own style and keep it to see the time as well. After receiving this pocket watch, it depends, you can take the protective film on its surface out or let it be. I still keep that film to protect the surface to make it look new as always. Another well-made pocket watch is from Victorinox swiss brand. This clock has a very impressive mechanism and design. Its colors are awesome with the deep red color. 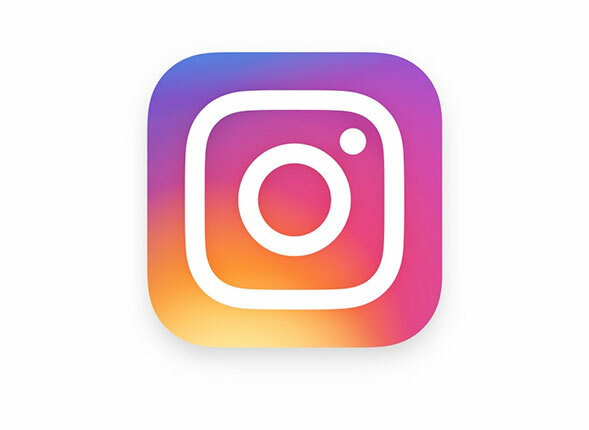 But it is frankly to say that for some people, this color can make them find difficult to read the time in case of the low light. This does not make sense, if you are a person who love the beauty. The Victorinox pocket watch is different from others with the alarm function. If you want to own 2 in 1 watch, you should keep an eye for this. This watch can be a fashion item, a pocket watch or an alarm clock. You can carry it when travelling because it is very convenient. Besides, this item is beautiful to look at all the time and easy to handle. Furthermore, the Victorinox watch is an example for precision instrument. 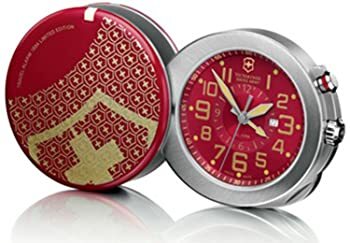 Many people said that they often make a mistake when setting the alarm with pocket watches; however, you can stop worrying, if you take the use of this Victorinox pocket watch men. With a few simple steps, your alarm watch can work very well. There is an only thing that I think you should keep in mind is the volume of the alarm clock. Sometimes, it is quite small, but don’t worry because it is adjustable. The last one is the Bronze vintage brass antique case pocket watch, which is a classy accessory. This men’s pocket watch with chain and dog pendant is various in design of the surface with around 20 different patterns. 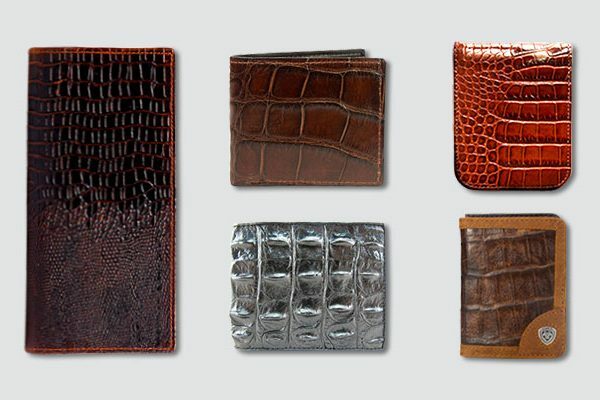 It can be engraved both back and front with vintage appearance design, and exquisite patterns. This package will come with a PC necklace chain, pocket watch, backup battery, and chain. When the battery runs out, you can replace by yourself. The bronze vintage brass pocket watch has a small size for carrying ease. Its case diameter is about 1.8 inches and the thickness are 0.55 inches. This item features brass antique case, practical item, Arabic numeral scale, and quartz movement inside. To set the time of this watch, you must take out the white clip. And then, press the crow for opening the case. Next, to turn the clockwise, you need to pull away the crown. You can take the advantage of this watch every day as the timepiece. The Vintage doctor antique watch is shiny, clear and easy to see the time. Here are all the pocket watches that I have experienced. Aside with these men’s pocket watches, you can find out others on the market. Generally, when purchasing a pocket watch, you should consider the quality, color, design and longevity carefully to make sure that it fits your needs perfectly.